The once grand city of Fornost Erain has long decayed into complete ruin. Over the years, the empty stones became home to many a creature. The Breelanders and other peaceful folk tells stories of the horrors that live at Deadmen's Dike, as the place became known. For many years the creatures prospered, until a vicious gang came down from the mountains. They were werewolves, shapeshifters. In the night, they slaughtered and hid the good ghouls and wights and mewlips and took their shape in the day, and planned to murder all the local residents one by one. But little did they know that among the simple creatures lived those with power to thwart them- and yet there also lived one who would do much to be accepted into their group. NIGHT ONE BEGINS. WOLVES MAY TALK AMONGST THEMSELVES. SEER MAY DREAM. ALL OTHERS REST (special roles - just please confirm by PM that you got the role from the second round). Edit: for those unsure about the deadline, this post was made 22 minutes late, after DL. Last edited by Galadriel55; 12-28-2017 at 08:27 AM. Day 1 begins (half an hour ago ). Narration to be edited in. By the way, since my schedule is so irregular now these couple weeks, those who are around at DL should feel free to poke and prod be through any means if I am late with the post. I can send my contact info to interested people so you can bombard me with messages if I'm being neglectful. "There is too much folk coming ro live here, it's getting crowded," said a fell voice on the air. "Ah, this place is not like Taur-nu-Fuin of old!" pined am undead bat in echo, "these broken stones are a poor dwelling next to the tall pines of my youth!" A fox joined the group, bidding everyone good morning individually and shaking their hand just a little too long for comfort. They were having breakfast when "Surprise!" - a sudden cry came from behind a large stone. Startled, a teacup pomeranian in a bicorne hat dropped her food. "How many times do you need to be told to stop doing that?" she yelled at the offender, "This is your last warning! I will not have it any longer!" The morning went on as usual until the absence of a normally abnoxiously talkative person was noticed. "Where is the Blossom of Dwimmordene?" the demigorgon asked. The search began. The body was found dropped from a cliff. The gorcrow and the warg climbed down to investigate (though the warg was twenty minutes late in coming). They found a note crumpled in the lifeless hand. "Two werewolves. Shapeshifters. Plan to kill everyone. Their nam..."
Everyone sighed in disappointment as the note trailed off leaving the names untold. Last edited by Galadriel55; 12-28-2017 at 11:06 PM. The Blossom lies dead, and by her own hand has identified her killers. Werewolves! Cursed canines from the dark years. And if it is wolves we face, then ought we not to look first to the confessed canines among us? Rune the fox; Sally Boo Joe the diminutive hound; Boro the warg; will you denounce these murderous kinsfolk of yours, or do you stand in league with them in the grim night? I don't see why I should have to denounce anything! The Vulpini clan has had no dealings with the Canina clan for generations. Perhaps all Canidae looks the same to you!? Personally I abhore violence, though in this case I say: "let's find these murderous swine and nuke them to hell!". A dark figure loomed behind the mourners, the icy glow of its pale eyes like remote and baleful stars. "Cold be heart and limbs so stiff,"
"and cold be sleep at base of cliff. unnamed the ones with evil plans. -Wait, does anyone have a better rhyme for 'seas'? I'd really like to give the poor Blossom a hideous dirge worthy of her, and "breeze" just doesn't seem to fit the mood I'm going for." I don't know I wasn't bred for the purpose of writing laments for the dead. Drop to a half-rhyme and use 'gaze'? Are we hunting murderers or rhymes here, anyway? Words can hurt too, man. If they can hurt, then surely they can kill as well. "Death to cattle, death to kindred, death to every mortal man..."
The fell voice on the air echoed across the ruins of Fornost Erain...as it so often did. The voice halted briefly over the broken Blossom. "But one thing never dies...the good name of one who has won renown". Why must those murderous outsiders come here to disturb us? Isn't there room enough for them over all the woods and fields those on two legs shun? Do you not want to play? Ok, ok, no more rhymes. I mean it. Look out for the PIT! A poet? So be it. Who harry mortals who chance by. A darkness from the Dark Lord's hand. Of werewolves rises from her grave. Yet who shall seek this town to save? While Blossom's soul in anguish sighs! Delighting the Wight (and all the rest). I look to the warg who's always late! I am all for a bit of early day one banter and randomness, but are we really going to let the wolves hide behind rhymes? Anyways, Huinesoron would you like to elaborate on the lines below? Beyond that final line, I was indicating that I find Boro's three posts without anything other than rhyming banter to be the mildest of suspicious. Yes, it's early Day One and all - but to make that many posts without even a single mention of the whole werewolf/murder thing seems a bit odd. I thought it was strange after two posts (hence my question, 'Are we hunting murderers or rhymes? '); his lack of a shift in response to that was enough for me to throw out the more explicit post in verse. My bad, I had forgotten Boro's true purpose, so I thought you might be referring to someone else. Sorry folks, this trip took way longer than I hoped it would, due to the wrong kind of snow on the motorway. Catching up now. I am afraid there isn't too much to catch up on, besides a few lyrical experiments. Goodness, wargs to the left of me, foxes to the right, wolves in our midst... whatever is an upside-down gorcrow to do? In light of the busy voting (*cough*), I made an update to the voting rules to clarify ties: the FIRST person to get the most votes is lynched. Well, I am trying to be active, but I know I'm not being productive. There is little in the form of activity nor productivity going on. As this is a straight forward, no bells and whistles situation, with a few murderers and a couple gifted, I would find anyone showing productivity (by knowing too much information) to be highly suspicious. With no unusual dynamics that need to be discussed amongst our ragtag band this will be a vanilla Day 1. Nothing big going on, just get through the day with my head attached cross my fingers during the night's slaughter. Just trying to make it abundantly clear I will be actively participating, even if the only thing I could participate in was answering questions about rhymes with breeze and what we're hunting. Well, there's not as much to catch up to as I had anticipated. Mostly IC banter, but so far nobody has even bothered to address the oliphaunt in the room -- what are we going to call Huinesoron? I'd suggest Hui (rhyming with Louie and Dewey), if that's acceptable. Whatever, he's tried to stir some discussion with a playful challenge, which is a good thing. Nerwen and Lalaith have been in character so far, and our surprise creature Zil has come out as a kind of berserker raccoon; glad to have that cleared up. -- I mean, I see no attempt to even seem productive in Boro's posts so far, just fooling around. I say he's Moon Moon and acting extra goofy so as to alert the wolves to his role. Discuss! EDIT: x-ed with everybody since my last one. Just trying to make it abundantly clear I will be actively participating, even if the only thing I could participate in was answering questions about rhymes with breeze and what we're hunting. I am also quite eager to be as active as I can, even if I won't be able to stay around to deadline. Anyways, it seems that things are picking up, and that we are starting to get some useful debate. I was thinking something along the lines of Huiny...but Hui probably works better. Admittedly it is a harsh assessment based on very little, but it is day 1 and we need to get the ball rolling. I find the Moon Moon theory quite plausible though. Beyond that final line, I was indicating that I find Boro's three posts without anything other than rhyming banter to be the mildest of suspicious. Yes, it's early Day One and all - but to make that many posts without even a single mention of the whole werewolf/murder thing seems a bit odd. Whereas no wolf has ever hidden behind cries of "woe, murder, everybody start some serious wolf-hunting! ", yes? There's being unproductive, and there's trying a bit too hard. With no unusual dynamics that need to be discussed amongst our ragtag band this will be a vanilla Day 1. What is a vanilla Day One to you? My premise was that a little bit of heat on people might shake something loose; I've managed to get reactions of one kind or another from you and Rune, which is what I was angling for. Those reactions are now available for everyone to look at and see if they find them suspicious. A Day One which consists of everyone writing poems and then lynching entirely at random doesn't give any of that. I'm not saying that's what you wanted to happen - but if everyone had posted 'knowing they're not being productive' then that's exactly what we'd get. ...so far nobody has even bothered to address the oliphaunt in the room -- what are we going to call Huinesoron? I'd suggest Hui (rhyming with Louie and Dewey), if that's acceptable. I normally use the initialism hS (I throw it around as a signature when I remember), but have no problem adapting to a new nickname. Now, if we were mortal Men looking for a depressed shoemaker, this would seem like a very odd suggestion (since Boro's behaviour wasn't exactly sowing confusion)... but this is Moon Moon we're discussing. A little excess foolishness to signal being the goofy canine is at least understandable as a plan. ... and then there's having nothing at all to comment on 14 hours after day start, when you know you'll be gone 3-4 hours before deadline (gorcrows go to bed early, y'know). Visions of seeing nothing in Day One but some poetry were whirling around my head. Thankfully, that hasn't happened. And if you think sparking off all these reactions is wolfy... well, then you're entitled to your opinion, I guess! What is a vanilla Day One to you? Not pretending to speak for Boro, but I suppose he meant Day One in a game with no special roles or rules adding extra game mechanics which need discussing, and in which the phantom isn't playing, hence no ingenious master plans to discuss either. Sharing similar bedtime habits, I can empathise with your predicament. And sparking reactions and getting a discussion on the way is of course the right thing to do on Day 1. I didn't say it was wolfy, just that it isn't necessarily proof of innocence either. So Boro could be suspicious. But maybe not. Leaving an out in case you're called on it? what are we going to call Huinesoron? I'd suggest Hui (rhyming with Louie and Dewey), if that's acceptable. How 'bout just Huey then? He might not appreciate the alternate spelling. I mean, I see no attempt to even seem productive in Boro's posts so far, just fooling around. I say he's Moon Moon and acting extra goofy so as to alert the wolves to his role. Discuss! I'm going to look at his posts and read them backwards while listening to the White Album. Pitch and Rune seem alright, as does Hui...as in not detecting sinister motivations within their posts. Removing myself from my shoes, and stepping into theirs, I would be looking at this Boro in the same way. Definitely an odd one. But I ask them to ponder does goofy mean bad or the cobbler, or a not-so-serious person that has all the time in the world to waste today because he barely gets these moments and wants to make the most of it? I'm a warg bred for a single purpose, being Moon Moon just isn't in my DNA. 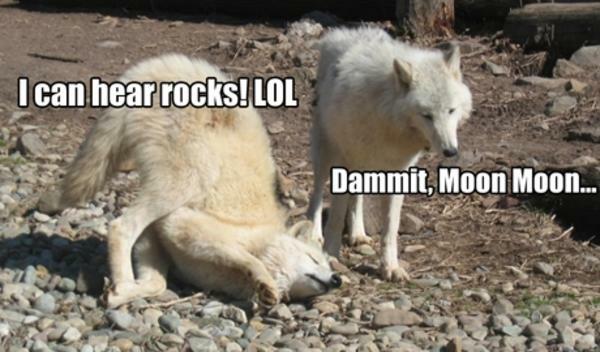 Who calls themselves Moon Moon anyway? Someone who is obsessed with terrible rhyming, probably. Therefor it's probably Nerwen. A Day when there is no face-value intelligence to go on. No murder, no dead trail, no gifted protections/reveals, no complex strategies that need to be discussed...just people around playing their roles. Everyone's got a part to play and this warg's going to at least have some fun playing his part, even if it's only enjoyable to himself. Who's to say we HAVE to lynch anyone today? Is a random vote for the goofiest one any different than a random vote for the most talkative? A random vote for the most absent? Who's to say there are even murderers? Or that the only murderer is the Blossom? I said he was Moon Moon, I didn't say he was Aleister Crowley. Who's to say we HAVE to lynch anyone today? "Just this once, everybody lives"? Please, not that again. A Day 2 with no lynch, no votes to analyse and draw conclusions from, how would that be different from your vanilla Day 1, and then? Rinse and repeat? I shouldn't even have to explain this, as I know you know that's how it works, so why are you even suggesting this? So you don't have to commit to anything? Who's to say we HAVE to lynch anyone today? * Is a random vote for the goofiest one any different than a random vote for the most talkative? A random vote for the most absent? A vote for someone who seemed to be using goofiness as a way to avoid discussion wouldn't be random. But see below. Rune - a bit over-eager to go after Boro, but that's mostly from one post. I'm mostly suspicious because he openly agreed with someone (me), which doesn't seem a safe thing to do in a village with wolves. Other posts haven't really added much, except a brief comment on the BoroMoon theory. Nerwen - poetry only, nothing to go on. Zil - Only one post of substance, but it isn't afraid to point fingers. On the other hand, one of those fingers feels like it might be tagging onto Pitchwife's 'trying a bit too hard' comment - if Zil thought Pitch suspected me, then the 'Sensible Pitch' and 'Overreaction' combo in post 29 might be an attempt to cozy up to her (so to speak). Pitch - seems really helpful. Has answered questions, offered theories, and commented on actions. At this point, Rune is probably the one I have least-weak suspicions against. He's up to... seven posts, I think, but they feel very sparse on actual hunting (much like he suggested Boro could be doing). The only real accusation is a spin-off and expansion of my own comment. If I had to vote now, I guess I'd vote for him. if Zil thought Pitch suspected me, then the 'Sensible Pitch' and 'Overreaction' combo in post 29 might be an attempt to cozy up to her (so to speak). To him, actually; male, German. Zil had a point though, and your response to my #25 struck me as a bit over-defensive too. Seems you like to poke people, but not so much to be poked in turn. I see what you mean about Rune, he was a bit quick to agree without a good reason. He seems to be rather skimming the thread than digging in. On the enigma of Boro, to be fair I've known him to be rather carefree on D1 even as an ordo. What worries me isn't so much his goofiness as his no-lynch-proposal, if it even was made in earnest - he knows better than that, but it would actually make sense for a cobbler who wants to avoid helping lynch a wolf by mistake. Which would mean he's not our biggest concern for now -- if he's indeed Moon Moon we don't want to lynch him, since he counts as innocent. Nah, I think I'm just turning pacifist over the WW years...I cordially dislike Day 1 lynches, depriving a person from playing before they really had a chance to get going. Even though, you're right and it must be done, you can't make me not hate Day 1 lynches. (And you could make the argument well they've had 24 hours to do something if they choose to). Maybe there's the time to delve into the ancient texts and see if a Day 1 lynching contributes to the overall success of the innocents, or if a Day 1 no-lynch actually is more beneficial to the wolves. Apologies. And... probably! No-one likes to be poked, do they? Though I'm also just very talky, and liable to respond to anything that looks like it might be directed at me. There's not. Not if you mean for this lynch. It's... well, late (for a gorcrow), and my understanding is that even one vote in play will cause a lynch. Since I feel that not voting during a lynch that actually happens is a bad idea, I intend to vote for Rune in about... 15 minutes unless I see 1) a good argument for no-lynch, 2) something from Rune that makes me reconsider, 3) a good argument for Rune's innocence, or 4) a good alternate candidate. I will have to vote soon, and even under the best of circumstances, I dislike a day 1 vote. I am never quite sure in my suspicions and second guess my self constantly. In a village as small as ours, I believe it would be counterproductive to vote for no-shows or people with very limited activity. We need a trail, we need something to analyze on for the days to come, and we need for everything to be out in the open so that here is no hiding. Even though it is grossly unfair that people can be rewarded for not participating, in my view it is the lesser of two evils. Inzil – Besides a typical day 1 starter Inzil has posted a single post which comments on some of the different statements made so far. Boro – The main talking point of Day 1. Has acted differently than what I remember, but the more I read through the thread, the more I like Moon Moon idea originally presented by Pitch. Pitch – Made a late entry, but has been productive and do not shy away from confrontation. Huinesoron – By far the most interesting person in the village. Very active, if a little bit jumpy. Is this an Alpha that enjoys the spotlight (perhaps there is even an evil plan) or is it a very eager Ordo? I would not want to vote for Huey, as I don’t know him, and I want to see where he takes this over the next few days. This leaves Inzil, Boro and Pitch. I like style of Pitch, and I must admit that I am backtracking a bit on Boro. He is definitely having fun today, and I don’t remember him like this (Unlike Pitch). The most plausible explanation would be Moon Moon… Inzil hasn’t contributed much mostly poking fun or posting simple comments. Who calls themselves Moon Moon anyway? Someone who is obsessed with terrible rhyming, probably. Therefor it's probably Nerwen. Definitely Nerwen. Isn't Moon Moon the town where she lives? Yet again, sense. Back on the merry-go-round. Day 1 is pretty much always a crapshoot, barring some amazing, spectacular See-action, but not voting has always seemed to me more of a help to the baddies. It's scary that I agree with Pitch so much so early. Again, a little touchy, this. I wouldn't vote him toDay just because of the First Game Pass. Doesn't seem sporting. Well yes, I am talking about today's vote. Okay, bedtime and votetime. I'm glad of the lengthy posts fro both Rune and Zil - it's great to have more to go on. The first three points have all been previously made in the thread; the last is an expansion of other people's suspicions (as was his original comment on Boro), and is pointed at the person who's several times named him as number 1 voting candidate.